If you want to know what you’re truly made of in a fight-or-flight scenario, participate in a 3-gun competition. There’s no better rush than running and gunning your way through various challenges. Think “The Amazing Race” but with guns… lots and lots of guns. Over the past year, we’ve spent a lot of time covering 3-gun and other forms of competitive shooting. We’ve looked at different types of shotguns and gear that can give you the competitive edge in 3-gun competitions. Today, we’re going to look at Heavy Metal. There are three different kinds of 3-gun competitions around: open, tactical optics, and heavy metal. Open Class: open is the no-holds-barred version of 3-gun shooting. Nearly every type of modification is fair game here, so you’re bound to come across some heavily-modded pieces. Think oversized pistol barrels, extended magazine tubes, and decked out optics. Tactical Optics: just like the name suggests, tactical optics is the use of tactical weapons. We’re talking AR-15s, top-of-the-line shotguns, and a trusty semiautomatic pistol. This is where you see people shooting guns that are optimized for real-life defense scenarios. Heavy Metal: an absolute badass class for the purists out there that combines big-boy weapons with iron sights (unless specified as a scoped competition). True heavy metal shooting requires a .308/7.62 NATO rifle, 12-gauge pump, and a .45 ACP. Leave your red-dot sights as home and learn how to shoot like your daddies and grandpappies. Now that we’ve covered the basics, let’s dig in and look at some of the top three-gun weapons for your heavy metal competition. When we talk about absolute favorites, the Springfield M1A ($1,479.00) is a tried and tested rifle that’s guaranteed to make an appearance at your upcoming heavy metal competition. It’s accurate, dependable, and can take a licking and keep on ticking. Interestingly enough, the M1A’s inspiration is the M14, an unsuccessful military-grade rifle that was decommissioned because it was considered too bulky and impractical for jungle warfare. The good news is that your 3-gun competition isn’t the same thing as jungle warfare. The bad news is that the biggest drawback to the M1A is its size. The M1A in all its glory. The M1A isn’t a light gun. It weighs anywhere between 8 to 11.5 pounds, depending on the variation. While this is not much of a problem during a weekend hunting trip, lugging it around this beast during an intense run-and-gun setting like the 3-gun competition can wear you down. Still, if you’ve got the endurance for it, an M1A is a good gun to carry around. You want a gun that’s built especially for competition? The JP Enterprises LP07 ($4,768.00) .308-caliber version is rifle that is deigned to have the look and feel of the AR-10, making it a great piece for high-intensity shooting. When it comes to a quality sniper rifle, the LRP-07 ticks all of the boxes. It’s accurate, reliable, and looks damn cool. In fact, the LRP-07 is one gun from a long line JP Enterprises rifles that are praised for being as accurate as some of the best bolt actions around. The LRP-07 is a tactical beast that shoots just as awesome as it looks. So, what makes the LRP-07 so special? For starters, it’s been completely optimized for competition shooting. It comes with a Magpul pistol grip that’s adjustable and is able to accommodate various hand sizes. In addition, it’s much lighter and easy to manage than the Springfield M1A. The biggest factors that set the LRP-07 apart from other competitive shooting rifles are its accuracy and durability. Many heavy metal shooters report little wear and tear and no difference in accuracy and performance, even after multiple seasons of constant shooting with their LRP-07 – all thanks to their heavy duty materials. What do you think of the JP rifle if price were no object? It’s tried, tested, and battle hardened in competitive shooting. It’s a gun that’s so easy to handle you can practically shoot it in your sleep. It’s the simplicity and reliability that makes the 870 a favorite in heavy metal competitions. But another reason why the Remington 870 is a good heavy metal gun is because of all the aftermarket accessories available for it. Whatever you want for your 870, you best believe someone out there has you covered. Overall, the 870 just gets everything right. It’s not too heavy (approximately 7 pounds), as durable as they come, and comfortable to shoot. Plus, it just looks really cool. It’s really hard to dispute that Benelli makes top-of-the-line shotguns. There’s a reason that they always make an appearance on lists for best shotguns, after all. So, what makes the Benelli Nova ($409.00)able to compete with other classic shotguns like the Mossberg 500 and the Remington 870? Innovation. When designing the Nova, Benelli used other popular shotguns as inspiration. They made note of the things that people loved about guns like the Remington 870 and Mossberg 500, as well as some of the common complains that people had. The Nova may look funny, but its performance is no laughing matter. Larger loading port for quicker reloading times. Heavy-duty polymer frame that’s lightweight and able to withstand a major beating. Button on the bottom of the forearm that blocks rounds for cycling, allowing you to stick a different round in the ejection port. Simply put, the Nova is a great shotgun to shoot. It’s comfortable and dependable, so you never have to worry about misfires or cycling problems. However, it’s not a looker. If you’re somebody who’s big on aesthetics, you might not like the appearance of this gun. But if you want a shotgun that’s dependable and smooth to shoot, the Nova might be just what you need for that upcoming heavy metal competition. Strictly speaking, most heavy metal rules state that your handgun needs to be a single stack 1911. However, there are some competitions that allow for any type of handgun that’s a .45 ACP or larger. For this reason, it’s always best to find out the rules and guidelines in your competition beforehand if you’re thinking of buying a gun specifically for your upcoming heavy metal comp. Now that we’ve got that out of the way, let’s look at two popular 1911s. 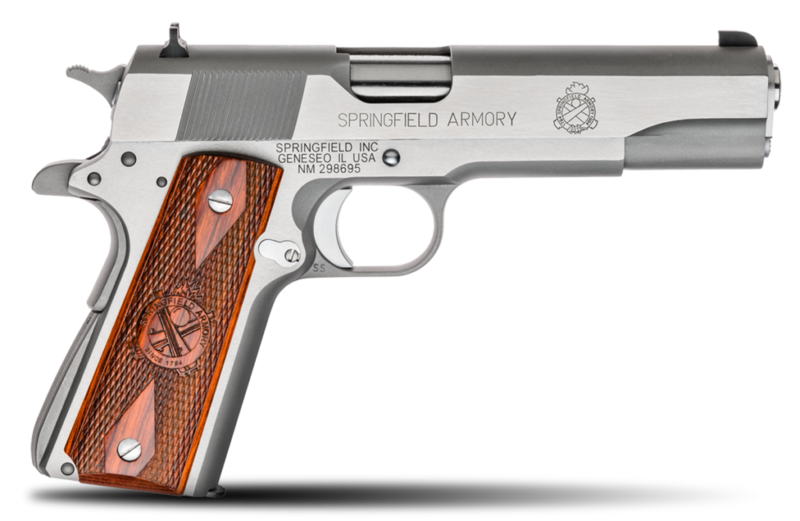 Don’t expect any extra thrills and frills with the Springfield 1911 Mil-Spec ($649.00). This .45 ACP is as basic as they come, just like the M1911A1 that it’s trying to replicate. But isn’t shooting basic firearms everything that the heavy metal competition is about? Nothing too fancy with 1911 Mil-Spec, just deadly accuracy. 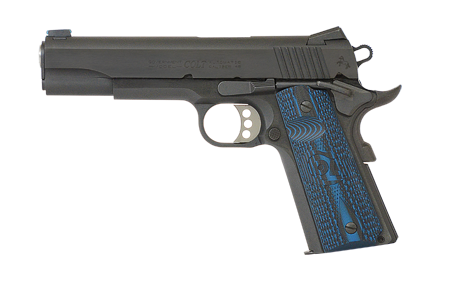 When it comes to getting the job done, the 1911 Mil-Spec passes with flying colors. It’s accurate, fun to shoot, and has a trigger that gives a good, clean break with every pull. The only downside to the 1911 Mil-Spec is the classic A1 grip safety, which can become uncomfortable for operators with large hands. But since it’s a 1911, finding an aftermarket grip safety should be a breeze. The Colt Competition ($869.00) is a great pistol to use if you’re willing to splurge on a .45 ACP. This handgun usually sells anywhere from $900 to $1000, but there are many who believe it’s worth every penny. With that said, the Colt Competition certainly lives up to its name as a top-range shooter. I know what you’re thinking. Why would I want to spend a grand on a Colt 1911? Because it’s a really smooth gun to operate. When you shoot the Colt Competition, you’ll notice that the trigger has been designed to minimize creep and give a clean, crisp break with every pull. Colt Competition 1911 looking majestic as ever. Overall, the Colt Competition is designed for maxim comfort. Its stylish blue grips are aggressive enough to stay secure in your hand but gentle enough to keep your palms protected after a day of shooting. Part of the grip near the mag release has been whittled out slightly to make it easier to change magazines, and the trigger guard has been slightly undercut to allow for a higher grip. The thing to remember about competition shooting is that what works for one person may not be as great for someone else – and heavy metal shooting is no different. Along with accuracy and dependability, part of what makes a gun a great 3-gun piece is comfort. So before you throw down on the top-rated heavy metal guns out there, go to the shooting range and try a variety of pistols, rifles, and shotguns until you find one that works best for you. Interested in trying heavy metal competition? Got a gun you like for competition? Let us know in the comments below! Seriously? An M1A and an LRP? That’s all you got? See a lot of either in your 3-guns? This article hits the nail on the head! A very impressive discussion of the qualities that make these weapons great!